McGregor Shott has opened a new office in Atlanta, Georgia. Located in Dunwoody at 285, Georgetown on the Perimeter provides close proximity to all points Metro Atlanta. "We're very happy to run our business in this area," says Lois McGregor, Creative Director and founding partner. "The location is ideal for clients. The offices are an open workspace environment with plenty of light and room for collaboration and inspiration." The offices are located at 4470 Chamblee Dunwoody Road, Suite 510, Atlanta, GA 30338. McGregor Shott is a 100% women owned graphic design and branding firm with offices in Los Angeles and Atlanta. The company's creative directors, Lois McGregor and Beth Shott have a combined experience of 45 years working in the graphic design, marketing, PR and advertising industries. The company has secured numerous, longstanding contracts with city governments, economic development agencies and universities and colleges. The company prides itself on excellent, responsive customer service, attention to detail and award-winning marketing. Lois McGregor can be reached at lois@mcgregorshott.com or by phone at 661-305-5600. McGregor Shott is thrilled to announce our contract for design, art direction, and production of the City of Santa Clarita's Seasons Magazine, an 80-page quarterly publication with a print circulation of 77,000 and online capabilities for registration. We are responsible for branding and managing the publication, as well as expanding a look which is both engaging and informative. Highlights include pages of editorial features, information on City classes, libraries, activities, programs, events, and more. McGregor Shott, Inc. is an acclaimed creative and branding agency located in Santa Clarita, CA and Atlanta, GA. They have over 20 years of experience in designing identity systems, campaigns, website design, trade show graphics, collateral, posters, logos, and many other related materials. McGregor Shott specializes in creating award-winning work for cities, colleges, and economic development agencies. For more information, contact Beth Shott, beth@mcgregorshott.com. McGregor Shott was recently chosen by the Los Angeles County Economic Development Corporation to design and format its all-new LA County Business Incentives Guide for release fiscal year 2015. The branding firm created the 128-page, 88-city Business Incentives and Resources Guide in time to meet the County's launch date, and overhauled the look to be user friendly to decision-makers and consultants representing both large and small, domestic and international businesses in all industry sectors. Sectioned according to Federal, State and Local Incentives, and colored accordingly, this brilliantly coordinated guide packed the potential to help businesses throughout the 4,000 square mile county save a tremendous amount of time and money on their bottom line. Following an RFP process, McGregor Shott was selected as the firm to head the rebrand of the City's relocation and economic development marketing materials. The City of Montclair, with a population of nearly 1 million people within a 10-mile radius, has long been a popular retail and dining destination. 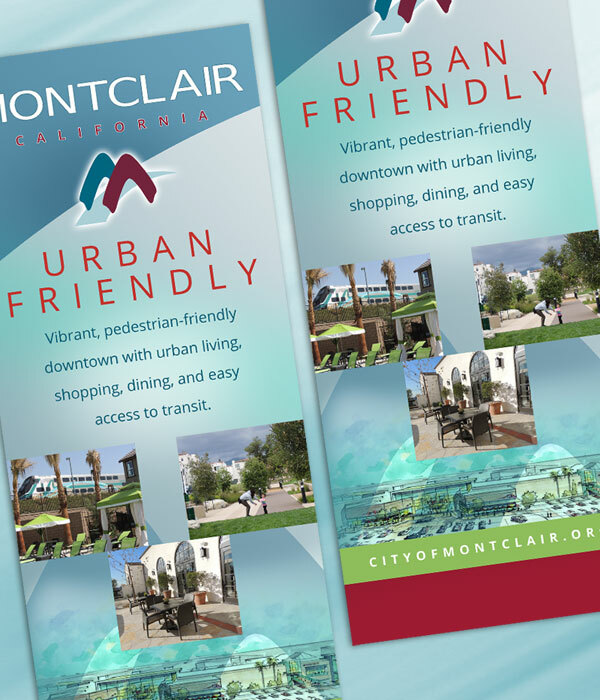 With the acquisition of the 1.25 million-square foot mall and the development of the North Montclair Downtown Specific Plan, Montclair was in the prime market for dynamic new developments. The City was rapidly becoming a destination for urban, pedestrian-friendly, mixed-use opportunities. To start, McGregor Shott designed materials for the Las Vegas International Council of Shopping Centers (ICSC) trade show. We created the brand with a young, vibrant population in mind, with the goal to bring in additional retail and restaurants into the area. Items included Trade Show Booth and Graphics, Industry Specific Handouts, Presskit Folders, Regional and Vicinity Maps. and Commercial Opportunities Guide. McGregor Shott, Inc. is an acclaimed creative and branding agency located in Santa Clarita. They have over 20 years of experience in designing identity systems, campaigns, website design, trade show graphics, collateral, posters, logos, and many other related materials. McGregor Shott specializes in creating award-winning work for cities, colleges, and economic development agencies. For more information, contact Beth Shott, beth@mcgregorshott.com. March 30, 2015. Santa Clarita, California. Following a RFP process, the City of Montclair has chosen McGregor Shott as the firm to head the rebrand of the City's relocation and economic development marketing materials. In preparation for the May, Las Vegas International Council of Shopping Centers (ICSC), McGregor Shott will design a trade show booth and graphics, along with printed handouts to include a presskit folder and inserts. The City of Montclair is an established city in the power position between Los Angeles County and the Inland Empire. A young, vibrant population, the City is poised to bring in additional retail and restaurants into the area. McGregor Shott will create a brand for the City in line with this goal. To see the new brand we created, click the icon below.